Family owned and operated since 1949. Our mission is to always exceed your expectations and to be a trusted and dependable partner, delivering the most competitive rate possible. From our humble beginnings to our current fleet, we continue to strive to provide safe reliable transportation of bulk products. Doyle Sims & Sons Trucking is looking for quality drivers in the Southeast to join our team! We invest in our employees and provide great benefits in a specialized section of the driving industry. CLASS A CDL IS REQUIRED FOR THESE POSITIONS! Driver pay ranges from $50,000-$90,000 annually depending on department and routes. Pneumatic tanker and liquid tanker positions available. Both OTR and Local lanes routinely available due to rotation and promotion. Work multiple departments to increase your pay as desired. Pay based on a percentage of what you haul with frequent pay percentage increases. Benefits available within 30-60 days of employment. Progressing 1 to 5 weeks of PAID Vacation time with continued employment. Employer contributed Major Medical, dental, and vision insurance available for employee as well as spouse and children. Aflac Policies and Short Term Disability policy available. Company paid 25K life insurance policy. Ameriprise Financial IRA with Company matching program. Frequent home time available as well as lucrative long runs with extended time off as an incentive. We value families and have caring dispatchers who actively work with each driver as needed. 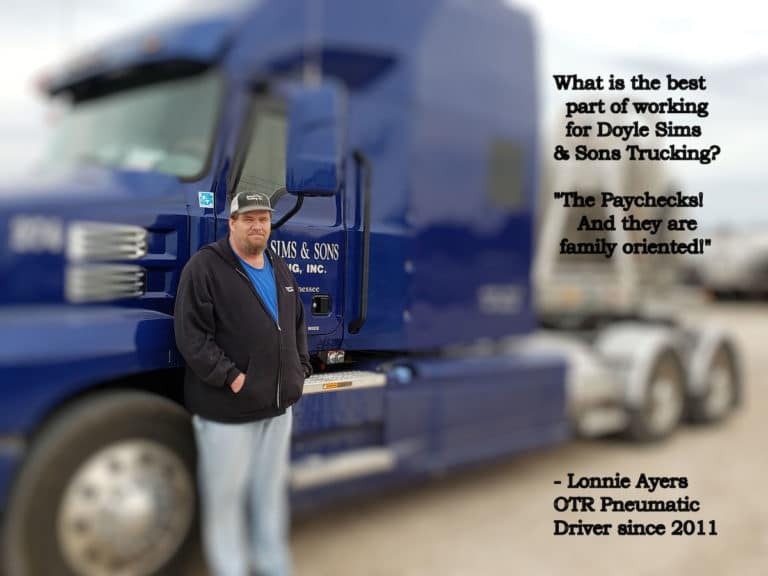 Doyle Sims & Sons Trucking started over 70 years ago with a single driver, Doyle Sims, himself. He worked 7 days per week hauling milk to local families. That work ethic and dedication has developed into a booming business with over 100 employees that still understands and appreciates the value of working men and women. We prefer at least 2 years of experience, but can train qualified drivers with at least 6 months of experience. Liquid lanes require a tanker endorsement; Pneumatic and positions are easily trained by our safety team and veteran drivers. Posses a Class A CDL. Meet basic MVR based good driving standards. Be attentive and seek to excel in our industry. Have good customer service skills and good temperament. Undergo and pass a background check and drug test. Contact us today by phone or apply online to see if Doyle Sims & Sons could be the change you are seeking! Let us show you how hard work and dedication can bring your career to a new level. You won’t be disappointed! Doyle Sims & Sons Trucking is seeking Class A CDL Drivers in multiple departments. Major medical, dental, vison, IRA, short term disability, Aflac, rider authorization. $200/Day for Training, $200 Weekends, $120 layovers. Drivers earn a direct % of our company’s revenue! Drivers earn between $50,000 to $90,000 annually. Direct deposit weekly! We can offer frequent home time. No Hazmat!